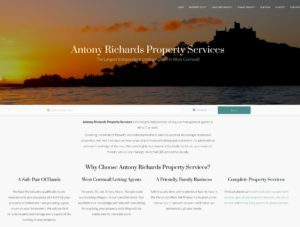 Antony Richards Property Services needed a new website for their property services business, which had just relocated to 10 Market Place, Penzance TR18 2JA. Web design Cornwall. The well-established company wanted a website that was responsive and worked well on mobile devices, ran quickly and displayed properties in an easy-to-view way. The new website has an extensive filtering system, so properties can be selected by price, location, number of rooms and property type. Antony Richards Property Services is the largest independent letting and management agents in West Cornwall. Covering the whole of Penwith, it understands what it takes to successfully manage residential properties with years of professional training and experience, coupled with an intimate knowledge of the area. The company is highly recommended by landlords for its professional, friendly service and manage more than 300 properties locally. Performing well in search engines, the new website was well-received by the client who can now upload their own properties.